St. Andrew’s Episcopal School strives to educate the mind, body, and spirit of children by promoting academic excellence and social responsibility in a small, nurturing environment that values faith, reason, and diversity. St. Andrew’s students, faculty, and staff strive to uphold a set of ten Core Values, which are emphasized regularly in Morning Exercises, in the classroom, on the playing fields, and on stage. 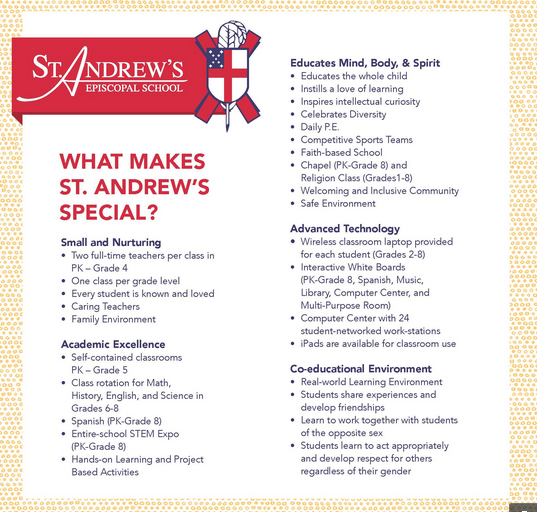 The Values are a direct manifestation of the St. Andrew’s Mission, Philosophy, Educational Objectives, and Honor Code. They represent an essential component of the School’s intentional emphasis on character development and decision making. Respect for self and others, academic honesty, personal integrity, and responsibility form the core values of St. Andrew’s Episcopal School. Respect means treating others the way we would like to be treated. Honesty is being fair and truthful in both character and actions. Personal integrity is demonstrated by applying an ethical code of values with honor and consistency. Responsibility is being accountable for our actions and accepting their consequences. The St. Andrew’s Episcopal School’s Honor Code expects students to practice these core values each and every day. The St. Andrew’s Episcopal School community values respect for self and others, academic honesty, personal integrity, and responsibility. As a member of the St. Andrew’s Episcopal School community, each student is expected to uphold the St. Andrew’s Episcopal School Honor Code in letter and in spirit.